Zest 4 Leisure Harriet Bench: The Zest 4 Leisure Harriet Bench is a beautifully designed garden bench made from smooth, curved wooden elements. With its Bavarian-style curves, smooth edges, and crossover style legs, this bench is simple and understated adds a touch of class to any outdoor area. Made from FSC Certified timber obtained from responsibly managed forests, the bench is pressure impregnated with a wood preservative that ensures long life and resistance to hazards associated with being left outdoors year-round. 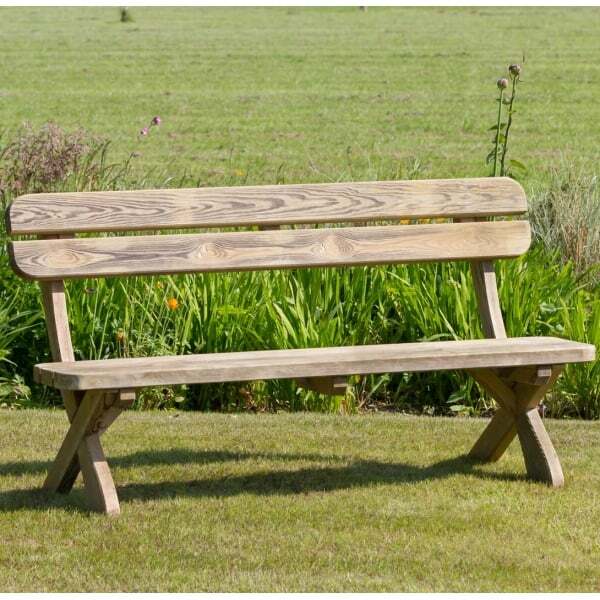 The bench is built to last, and comes with the manufacturer's ten year guarantee against rot. An elegant, versatile, and practical garden seating option, the versatile Harriet Bench is a great addition to any outdoor space and is sure to last for many years of regular use. Self-assembly is a straightforward process with full and easy-to-follow instructions provided. All necessary fixings are included, making assembly quick and simple with a minimum of DIY skill.